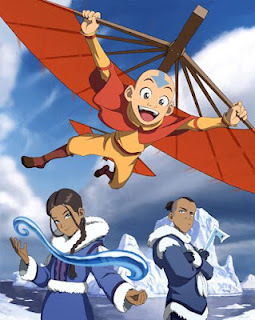 I considered waiting until I’d finished my Legend of Korra marathon in order to do a combined post on Avatar: The Last Airbender and its sequel, but I just have so many feels from Avatar that I cannot wait. First off, I’ll review it positively and say that if you haven’t watched this show, then you damn well should. You don’t need to have kids to enjoy it, though I certainly did enjoy doing so with my girls (6 and 4). It makes a mamma proud to see them waterbending in the bathtub and earthbending on the lawn, however, I’ve had to enforce a no bloodbending at the dinner table rule. It has the right amount of colour, action and silliness to keep the kids happy, but it’s the character development that has me so utterly in love. One of the overriding themes is redemption – and not just for the “bad” people, along with the misconceptions of what is strength and what is weakness. There were many moments that had me in tears, many of which involved Iroh, especially the wonderful tribute paid to Mako, Iroh’s voice actor. This is a story about war and it shouldn’t be taken lightly that it is young teenagers who have the responsibility of saving the world placed squarely on their shoulders. But I love the empowerment from all the adults; there is no doubt that these kids can do what needs to be done and none of the adults ever try to hold them back to prevent them from realizing their potential. We live in a society that coddles children far too much. Of course I don’t want to send my kids to war, but what I do expect is that children be treated with the respect they deserve and allowed to do and be what they need to do and be, rather than be limited by our fears and doubts of their abilities. Do not underestimate or take for granted what our children are capable of learning and doing. Avatar is also very empowering to women. There was only one episode where I was disappointed to see a woman in the obligatory trope of having to prove herself worthy, but otherwise, women were well and truly equals in all aspects. Now on to the spoilery thoughts. The moment I realized this was far more than a kids show was when Sokka met Yue. I feared they would turn this story into a typical peasant boy proves himself to the princess and defeats the snotty fiancé type story, but was I ever wrong. This was the most beautiful love story I’ve seen of late and it was the first moment when Avatar brought me to crying mess status. I reported this to my friend who informed me that some people had actually expressed negativity over Yue’s actions, indicating that she was one of the weakest women in the show. Clearly, those people did not see the same woman I did. This argument made me initially think of the quote from Kushiel’s Dart, “That which yields is not always weak,” but then I changed my mind. Yue did not yield. Not for a moment. Upon realizing what was happening, she accepted the fate she knew was hers all along and said good bye to the man she'd fallen in love with. She sacrificed herself to save her people without an ounce of hesitation. Not all battles are fought with swords. Yue was a warrior in her own right and I defy anyone who says otherwise. Toph. Just. Everything about Toph. Because. Toph. 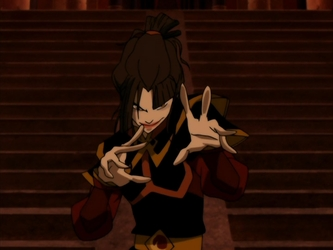 My only major disappointment was with the fire lords and Azula. I wanted them to be more than just the necessary big bads that want to take over the world. Sozin’s reasoning for wanting to do so was a bit weak, but it was by far better than Ozai’s general BURN ALL THE THINGS FOR I AM THE PHOENIX KING! megalomania. I had hoped he would be far less two-dimensional than that and that we’d have had more opportunity to get to know him and understand his motivations as we did with Sozen. I suppose that is where Azula comes in. It could be assumed that he is simply very much like his daughter in personality. It serves to explain how she came to be as she is, and it can be speculated that Sozen raised and pushed Ozai in a similar fashion, while Iroh and Zuko learned something more about compassion and humility and were thereby able to change their ways and seek redemption.